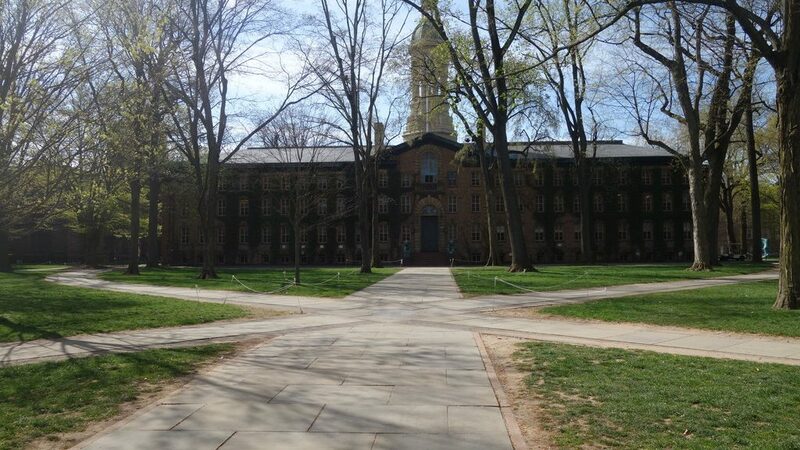 A few hundred yards from the bustling centre of the New Jersey college town of Princeton is the town’s two-hundred-and-fifty-year old cemetery. It is a quiet resting place for everyone from the theologian Jonathan Edwards to Vice President Aaron Burr, the man who shot and killed Alexander Hamilton. Not far from these graves lies the simple tomb of John Witherspoon, who died and was laid to rest here in November 1794, seventy-one years and over three thousand miles from his birthplace in the small village of Gifford, some fifteen miles east of Edinburgh. John Knox Witherspoon lived a remarkable life. A Presbyterian minister and theologian, he had opposed the Jacobite rising in 1745-46, and he was briefly imprisoned at Doune Castle following the Jacobite victory at the Battle of Falkirk. Witherspoon’s first ministry was in Beith, Ayrshire (1745-58). Beith was a small market town of some 700 ‘examinable persons’ who were eligible for church membership, including farmers, labourers, and skilled craftsmen including masons, saddlers, shoemakers, smiths, coopers and carpenters. Amongst these was a young boy named Jamie, an apprentice joiner living and working under the supervision of a carpenter named Robert Morrice. Jamie approached Witherspoon and asked to be instructed in Christianity and then baptized and admitted to church membership. Jamie had been born in Virginia, and he was an enslaved African American, the property of Robert Shedden, Morrice’s brother-in-law. Jamie’s race and status did not prevent Witherspoon from instructing the young man, and eventually baptizing him. But perhaps Witherspoon had been less certain. He gave Jamie a certificate of good Christian conduct, a kind of religious passport which would enable him to worship and take communion in other churches. Such documents were usually given to people who expected to travel and live elsewhere, and shortly after receiving this certificate Jamie ran away from his master, eventually settling in Edinburgh where he worked as a joiner and perhaps even worshipped at a church in the city, until he was captured and imprisoned, where he died. This was not to be the first time that Witherspoon would encounter enslaved African Americans. In 1768 he accepted an invitation to become president of the small Presbyterian College of New Jersey (Princeton University). Witherspoon did much to make a success of the small and struggling college, and he is commemorated as one of the university’s most important leaders. His achievements reached far beyond the small college. Arriving in the colonies immediately after the Stamp Act crisis, Witherspoon became a leading Patriot, and was elected to represent New Jersey in the Second Continental Congress. A signer of the Declaration of Independence and an active revolutionary, Witherspoon was forced to evacuate the College of New Jersey when the British army captured the town late in 1776. He supervised the repairs of Nassau Hall thereafter, and in the summer of 1783 the college briefly served as the capital of the new American republic. Slave ownership was common in New Jersey, and pervasive in the Southern colonies. Witherspoon supported himself and his family with a small New Jersey farm, but much of the labour on the farm was furnished by enslaved men and women who he owned. At his death Witherspoon’s estate included two enslaved people, human property that he willed to his heirs. 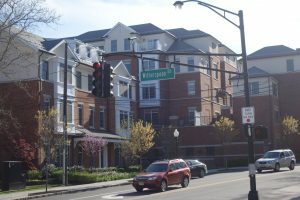 Indeed, in 1790 Witherspoon voted against a plan for the gradual abolition of slavery in New Jersey, although this may have been because he thought the plan ill-conceived rather than because he opposed the freeing of slaves. John Witherspoon provides a good example of the complexity of slavery in eighteenth-century Britain and America. An educational reformer, and an exponent of Scottish moral sense philosophy, Witherspoon may well have felt a natural opposition to slavery. As a young minister, he may have been heartened by Jamie Montgomery’s Christianisation: it was surely the first time that he had helped a heathen, as he would have seen the young man, become a God-fearing Christian. Perhaps, too, Witherspoon knew that he was helping the young Jamie prepare to seize his own freedom. Yet in America Witherspoon would himself own slaves, and he did not become a vocal opponent of the institution. Did this mean that he had become as pro-slavery, and perhaps even as racist as many white Americans? Perhaps, and it is hard to reconcile his slave-ownership with his earlier interactions with Jamie Montgomery. But we do not know the nature of Witherspoon’s relationship with the African Americans he owned. Did he instruct them in Christianity, and did he foresee an eventual life of freedom for them and their descendants? It is all but impossible to know what Witherspoon really thought about African Americans and about the institution of slavery. 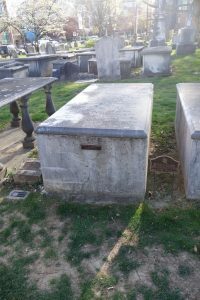 Not far from John Witherspoon’s grave in Princeton Cemetery is the last resting place of James Collins, who died in 1902. Johnson was born a slave in Maryland in 1816, but he ran away in about 1843 and changed his name to James Johnson, making his way to Princeton where he made a living working in the university. However, he was recognised and his master alerted, who promptly instituted a law suit to recover his escaped property. The Fugitive Slave Act would have required Johnson’s return to slavery in Maryland, but a wealthy Princeton resident named Theodosia Prevost intervened and purchased Johnson’s freedom. Grateful to his benefactor, Johnson slowly repaid her with the price of his purchase, and he continued making a living as a janitor and used clothing salesman, before securing the right to sell food and drink to students on the college campus. 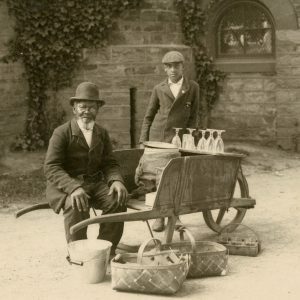 For the rest of his life he sold food and drink from a barrow to Princeton students, including at college football games. 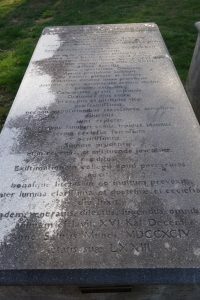 When he died, after more than sixty years of living in Princeton, university students clubbed together to purchase a memorial stone which lies atop his grave to this day, commemorating him as ‘the students’ friend’. In the 1750s as a young minister John Witherspoon had befriended a young enslaved man in the middle of Ayrshire, welcoming him into the minister’s congregation, and whether intentionally or not, helping the young man in his plan to run away and secure his freedom. 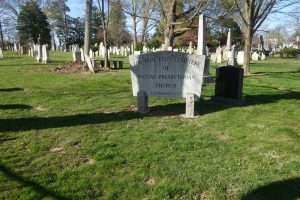 Today, more than two centuries later, Witherspoon lies at rest only yards from the grave of another runaway slave, a man who was supported in his escape by the students of the college Witherspoon had done so much to develop. As with so many British Americans, Witherspoon’s relationship with and attitudes toward slavery is complicated, and it is in these complexities and contradictions that we can come closer to understanding how and why racial slavery existed as it did in America and Britain more than two centuries ago. Final image credits: James Johnson and unknown young man, c.1890. Historical Photograph Collection, Individuals Series (AC67), Box MP4. Mudd Manuscript Library, Princeton University.